Roasting the butternut squash brings out the best of its sweet flavor, but despite it's starchy nature, the squash emerges a tad too wet to be rolled into a dough. Flour supplies the solution, lending a hearty hand to bolster the butternut's molten flesh and absorb the excess moisture. (Home Made's recipe calls for bread flour, however, I substituted whole wheat in my version.) The dough is very sticky and slightly difficult to roll into ropes, though showering the work surface generously with flour helps solve the problem. Despite the irregular shape of my pasta (which, gives them a charming character, mind you), these nougats exude the color and flavor of butternut squash. 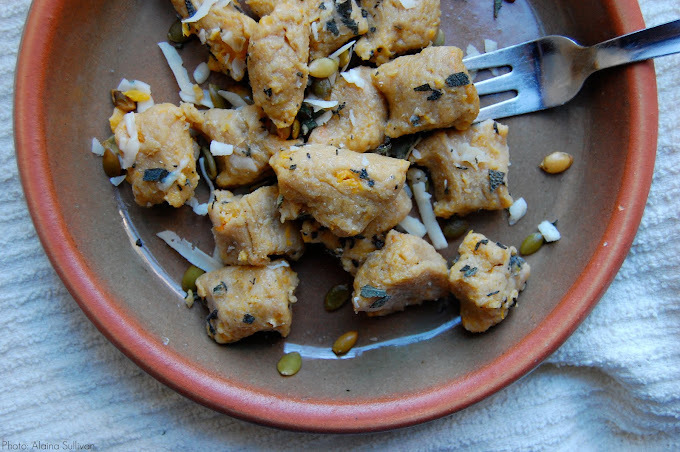 Flecked with fresh parmesan, sage and pepitas, the melding of flavors is divine. 1. Preheat the oven to 350 degrees. Peel the butternut squash, cut in half, remove the seeds and pulp with a spoon. Slice the squash into 1/2-inch pieces and arrange on a baking sheet lined with parchment paper. Sprinkle with salt and bake for about 30 minutes, or until tender. 2. When the squash has cooled a bit, press it through a potato ricer, or mash with a hand blender / food processor until smooth. 3. On a clean work surface, add egg yolk and flour to the squash. Mix using your hands (or a fork -- it will be very sticky). Season the mixture with nutmeg, pepper and salt. Note: If the mixture is too wet, add more flour, but be careful not to add too much or else the gnocchi will become tough. Note: Save the gnocchi on a flour-dusted baking sheet and cover with a dish towel until used. 5. When you are ready to cook the gnocchi, bring a large pot of salted water to a rapid boil and cook in small batches. The gnocchi will float when they are cooked -- it shouldn't take more than 4-5 minutes. Drain the gnocchi and drizzle with olive oil. Top with grated parmesan, sage and toasted pepitas as preferred.